They are high-flying pranksters who do not have to utter a single word to get a crowd going. For some, they are the highlight of the game, the crowd pleaser who come around to hug you if you’re a fan or, perhaps, “accidentally spill” something on you if you’re rooting for the opposing team. The mascots are one of the most entertaining parts of sports culture, with unique personalities and tricks that each mascot is known for. From Mr. Met to Mike the Tiger, fans and players alike have grown to love and follow their mascots on to the field or even Twitter. Their acrobatics are amazing (have you seen some of the dunks the NBA mascots do, even if it is with the help of a trampoline??) and they will do just about anything to get the crowd chanting, cheering or even laughing. Some teams, mostly universities, have live animal mascots. Mike the Tiger graces the field or LSU before home football games and Colorado University runs with their buffalo down the yard markers. Others have humans dressed up as their character, like the University of Southern California Trojan or the Notre Dame Fighting Irish Leprechaun. Others, such as Otto the Orange or the San Antonio Spurs Coyote, are snug inside their costumes, rain or shine, heat wave or below freezing temperatures. They’re based off of humans, animals and some of them (we’re looking at you Big Red), well, we’re not really sure what they’re supposed to be. But you better be sure that they get the job done. We want to start out with a special shoutout to an unofficial mascot that represents college better than any other mascot can. 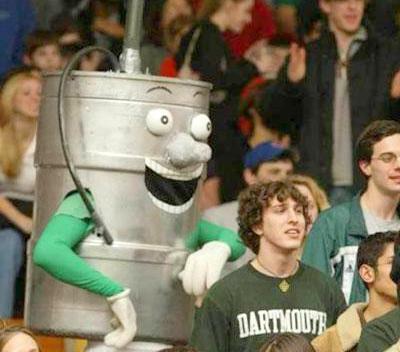 Dartmouth College doesn’t have an official mascot, but they have Keggy. Keggy the Keg was created in 2003 by a college humor magazine as a way to fill the void left when the college’s Indian mascot was abolished. At first, Keggy was a controversial character, but overtime, the college, and arguably the nation, grew to love him, and he is now a part of Dartmouth’s culture (and possibly all colleges in the US). 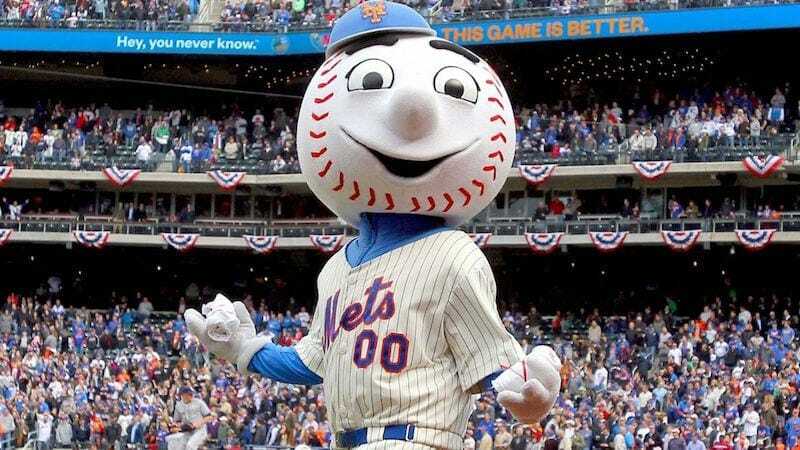 Mr. Met is the oldest “living” mascots in Major League Baseball, making his debut in 1963 when the Mets were still playing at the Polo Grounds. In 1964 he was named rookie of the year for being the first live-action mascot. Mr. Met has even travelled overseas, becoming the first mascot to do so in 2000, when he flew to Japan. He may have no voice, but he definitely knows how to get the crowd going. He even uses social media to spread his messages, and is known to get a little feisty on his twitter accounts. No one is safe, not even the Mets. The Coyote is a slam dunk for San Antonio. From his acrobatic dunks, to dressing up like a Christmas tree, riding around the court on mini bikes and even making fun of celebrities (most recently Mariah Carey) the Coyote has mastered entertaining the masses. In 2016, after nearly two decades of leaps and antics, the man behind the mask retired, but thankfully for San Antonio, and for basketball fans everywhere, a new guy stepped into his shoes, or costume. He’s one of the smiliest of the bunch. 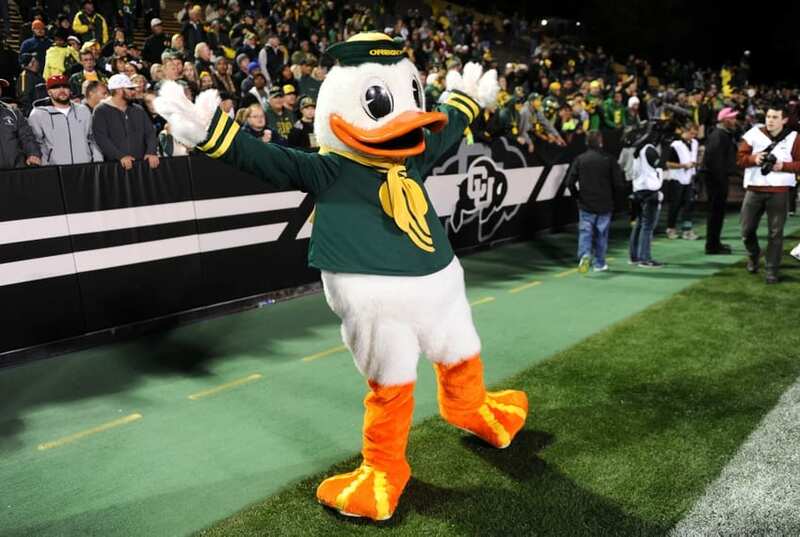 The Oregon Duck, has been around since the 1920s and is one of the most well known mascots in the United States. He’s so loved, that for his 50th birthday 3,000 to 4,000 fans came to a presentation of a cap and gown, when he was named an honorary alumnus of the university. He is one of only two duck mascots, Oregon and the NHL’s Anaheim Ducks. 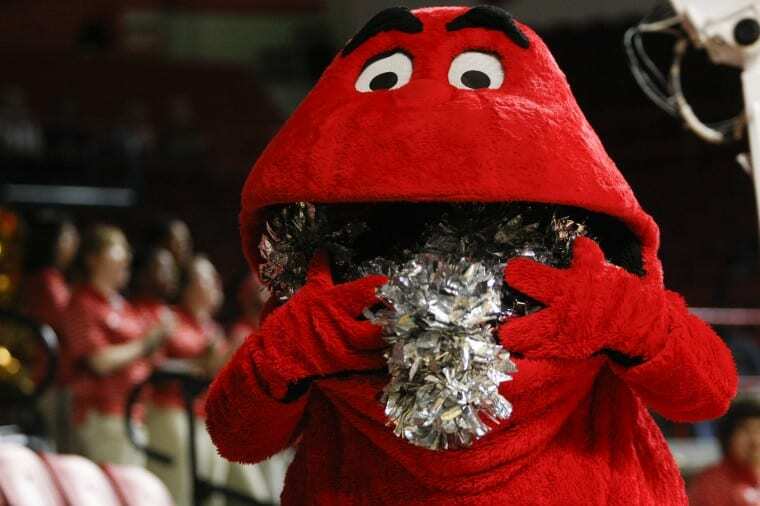 If you figure out what Big Red actually is, let us know. The Western Kentucky mascot is a blob of red with high eyebrows, a wide mouth and “WKU” written across his belly. Big Red has been around since 1979, and has even been in several ESPN commercials. He was created by a former student who drew a big red blob and handed it over to a committee, and so he was born. Over the years he was presented with several awards, and was inducted into the Capital One Mascot Challenge Hall of Fame. You may know him for his bright green color, his physique and, most importantly, his belly twirls. 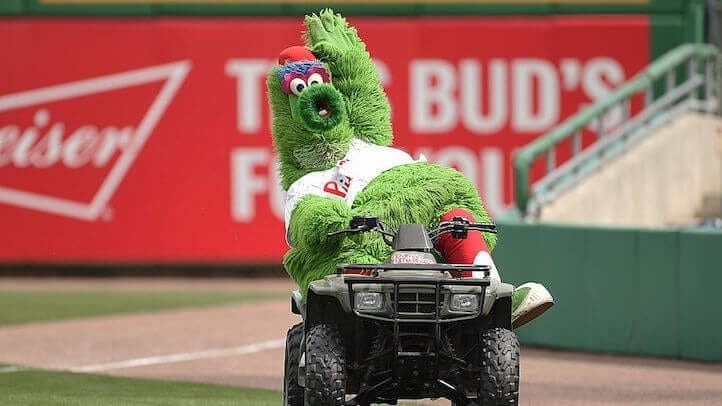 He’s the Philly Phanatic, the creature who entertains the Philly crowd at home games in Citizens Bank Park. He likes to show off his dance moves with the security guards, challenging anyone to a dance-off. He made his debut in 1978, during a game between Philadelphia and the Chicago Cubs and was created with help from the creator of the Muppets, Jim Henson. His costume is one of only three mascots to make it to the Hall of Fame. Cartoon Network named Rocky the “Most Awesome Mascot” in 2013, so he must be doing something right. But he’s also doing some scary things just to get the crowd going and excited. In 2013, Rocky had to be lowered from the rafters after losing consciousness, but was okay after the incident. Thankfully Rocky recovered, and went right back to his job as entertainer and even went political, by making an appearance at a GOP event back in 2014. Rocky was inducted into the Mascot Hall of Fame in 2008. 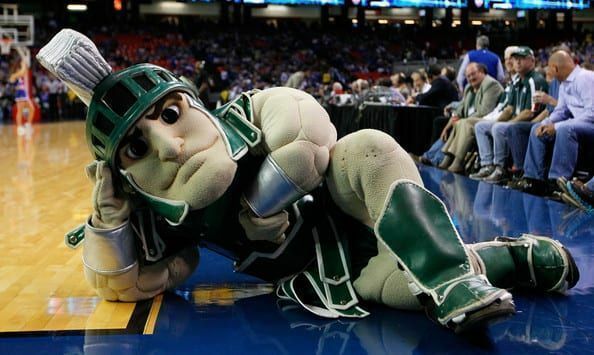 Sparty wasn’t always this buff, play-doh-y looking man he is today. The Michigan State mascot costume was first introduced in 1989, and in 1995 became famous after he appeared on a SportsCenter commercial. You can find him on the field or the court, getting the crowd riled up for games. The Universal Cheer Association named him the national champion mascot three times, and he was voted “buffest mascot.” He even makes appearances outside of Michigan State. Sparty fans just can’t get enough of him. Who knew a frog can be so intimidating. 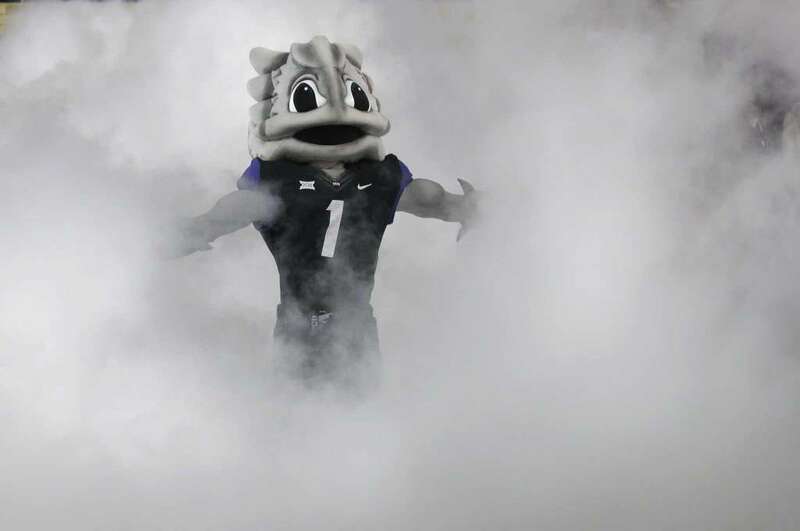 Texas Christian University has a bulked up, spiked “super” frog as their mascot – matching their school nickname, the Horned Frogs. The horned frog is a reference to the Texas horned lizard, a spiky lizard with horns that looks a lot like their living mascot. The horned frog had several looks changes throughout the years, and he didn’t gain notoriety until closer to the year 2000 when he bulked up and became menacing. He’s not a mascot you want to start a fight with. This is probably the weirdest mascot on the list, and possibly in all of sports (and that includes Big Red and Otto the Orange). 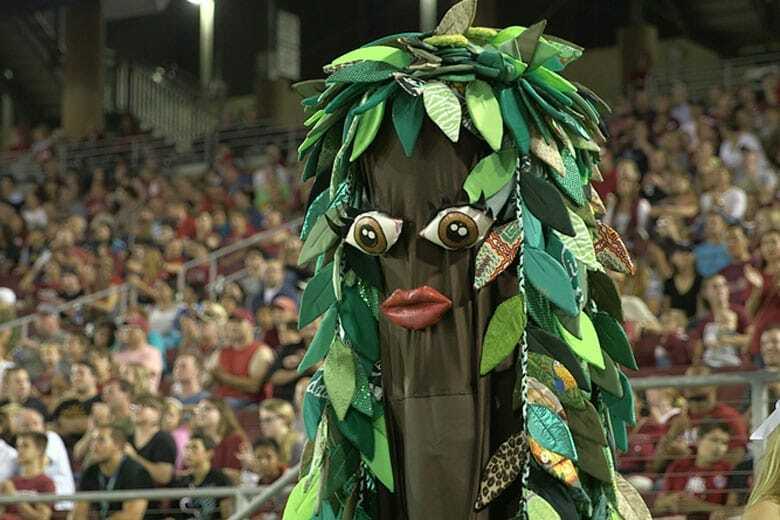 Stanford’s mascot is a legit, weird-looking tree. The tree itself is a member of the band and not the official mascot, but regardless, it’s what’s associated with the Cardinals. This tree, with it’s crazy “leaves” and googly eyes has the most fun on the field, leading the band and the student section. The Notre Dame Leprechaun is more than just the cartoon on apparel. 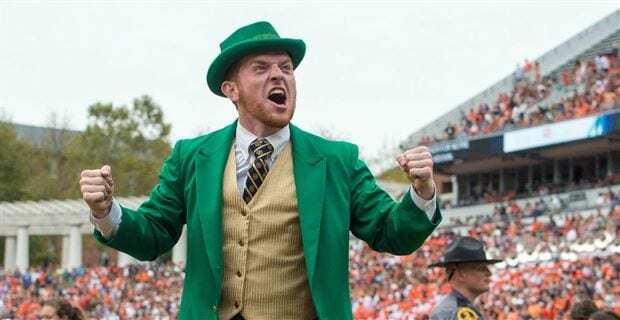 Every year a man dresses up as the mascot for the Fighting Irish, a feisty leprechaun; he has a shillelagh (a walking stick associated with Irish folklore) and leads the crowd on both the football field and basketball court in chants, bringing “magical powers” to the team. He was made the official mascot back in 1965. Before the Leprechaun, the Notre Dame mascot was a series of Irish terrier dogs, named Clashmore Mike. He’s fuzzy and looks cuddly, but don’t let that confuse you. 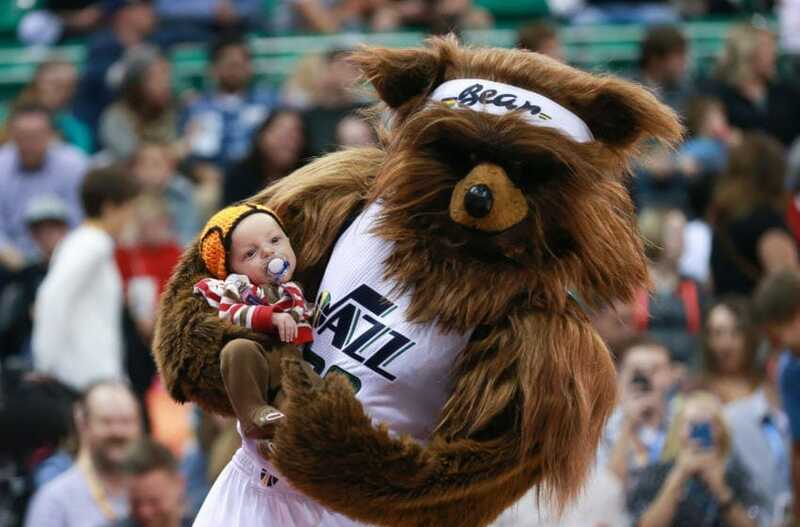 Utah’s Jazz Bear is usually up to no good and mayhem while running up and down the sidelines. Of course, like many of the NBA’s top mascots, Jazz Bear does trick shots and dunks, but he’s also known for confronting fans. 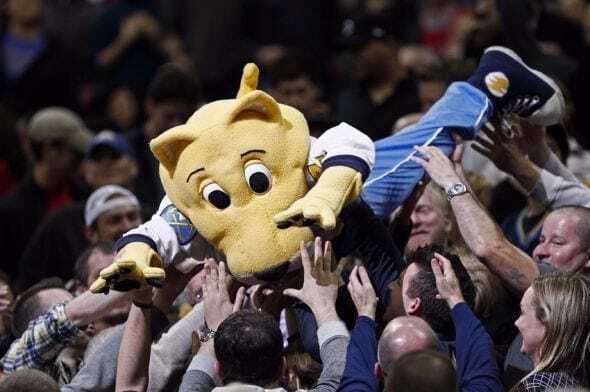 This is the mascot that dropped a birthday cake all over an unsuspecting fan and got into a silly string fight with a Houston Rockets fan and his son (that fight would later turn ugly with a fan kicked out). If you’re from the opposing team, you may not want to get on his bad side. He may not look like the grizzly bears you’re used to seeing at the zoo or Google images, but Grizz is definitely the most entertaining grizzly bear out there. Between his high flying dunks and his antics on the court, there is never a dull moment in Memphis. He was even named the 2011 Mascot of the Year by other mascots. 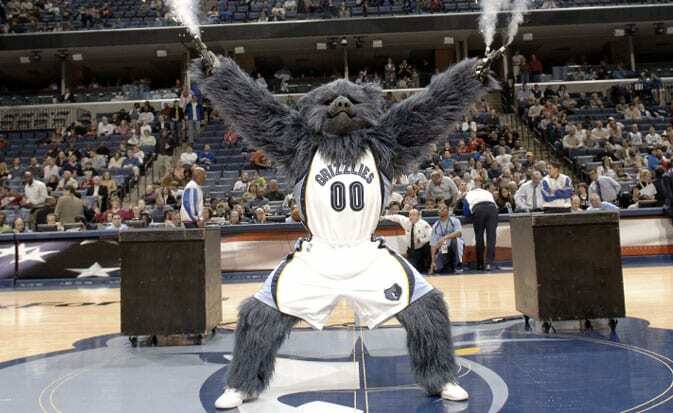 Grizz made his debut in 1995, when the team was still Vancouver and even has an alter ego named Super Grizz. The Milwaukee Brewers have an official mascot, Bernie Brewer. But they also have the famous racing sausages. They started out as three cartoon sausages on the scoreboard: the Bratwurst, the Italian Sausage and the Polish Sausage. Eventually they added two more, the Hot Dog in the 90s, and the Chorizo in the 2000s, and they became living mascots who race during the seventh inning stretch. 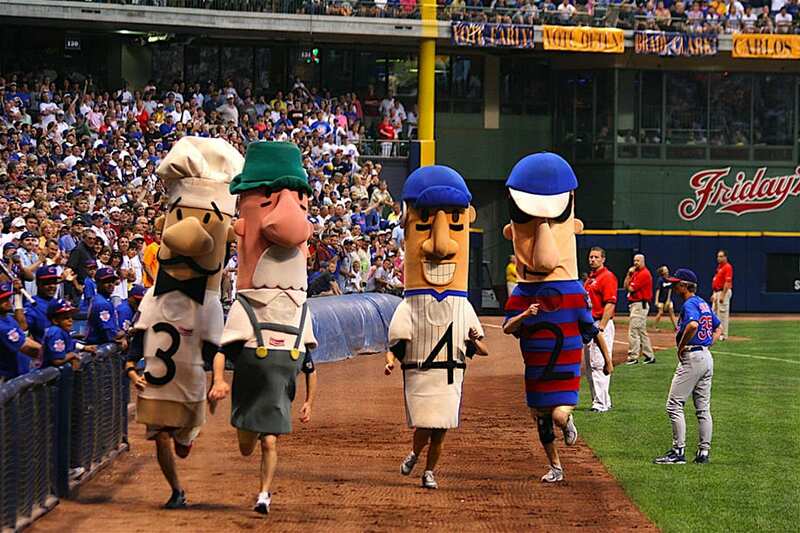 Miller Park employees or Milwaukee Brewers employees usually put on the costumes to run the races, and they’ve even inspired other races in the league. Maybe he’s a lucky parrot. During his first season cheering on the Pirates in 1979, Pittsburgh won it all. But it was also the last time they won the World Series. He helps stretch the players, dances with them on the field, waves the pirate flag and even has his family visit the field with him. 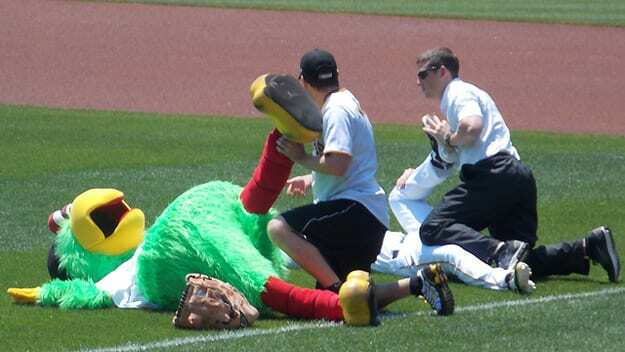 According to the Pittsburgh Pirates website, Pirate Parrot not only helps get the crowd going at games, but has also helped create a green campaign to help save the planet. Back in 2015, Brutus Buckeye celebrated his 50th birthday. Brutus is the embodiment of a buckeye, which is a small brown nut with a light patch (just look at Brutus’ face to see an explanation for that). There was a contest to name the Buckeye, and so the name Brutus came about. His look has changed over the years, and his modern costume dates back to 1981. 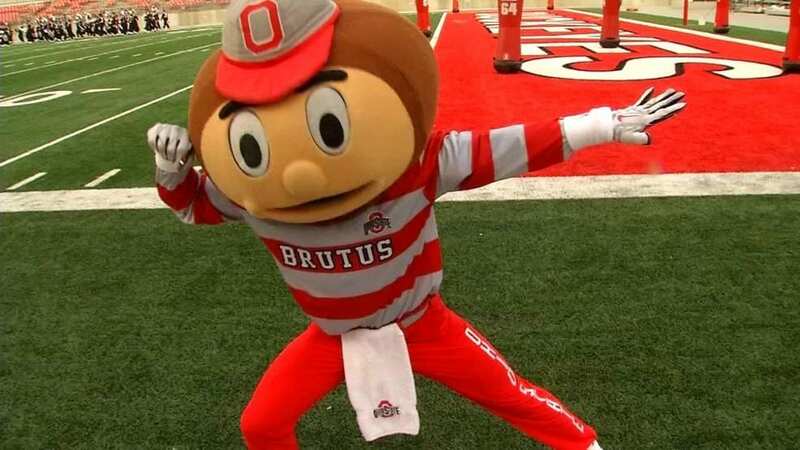 Brutus is a fan favorite, doing pushups when the team scores a touchdown, head stands on the field and fighting with other mascots. 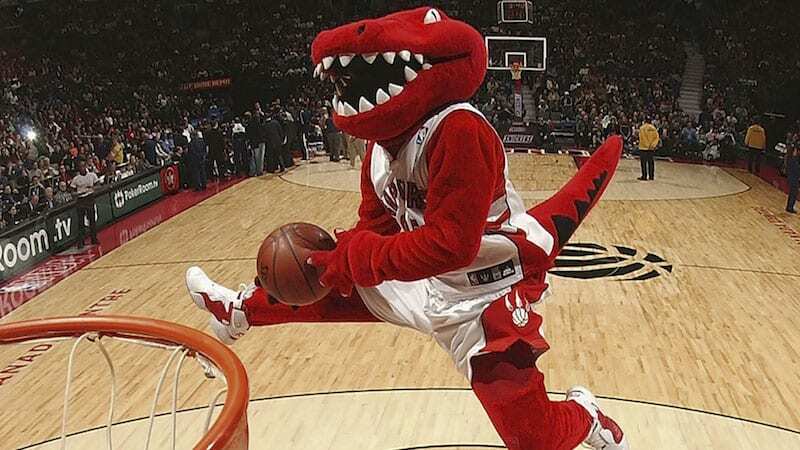 The Raptor, the official mascot of the Toronto Raptors, is a YouTube sensation. He’s such a big hit, and is known for his acrobatic dunks, that he was even challenged by Canadian tennis star Genie Bouchard to a showdown that became an international headline. But back to his actual job: entertaining the fans. The Raptor does it all, trick shots, practicing with the team, off court appearances. He’s been named by his peers as one of the best in the biz, and we’re sure that Raptors fans will agree (except maybe for that one fan who won a flatscreen TV but the Raptor dropped it, oops). 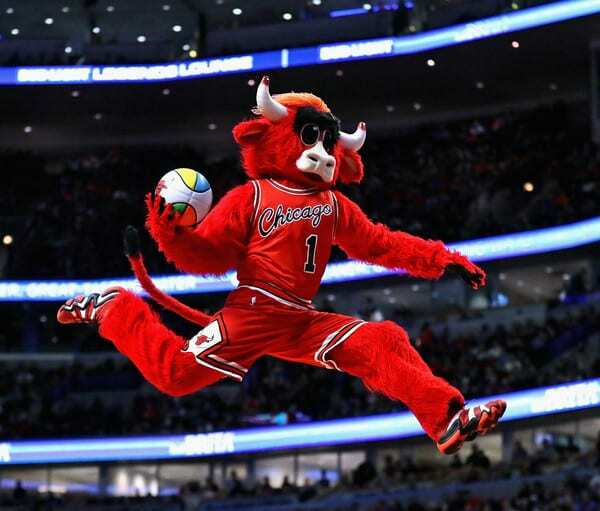 Benny the Bull is all over the court. From dancing with cheerleaders, to throwing down insane dunks and sneaking up on the broadcasters while they’re on air, he’s everywhere. He’s even off the court, making between 150-250 appearances every year, and was even invited to Dubai and London to perform some of his dunks. He made his debut in the 1960s and is said to be the first mascot to roam the NBA courts. He also slimmed down at one point and now sports a healthier physique, so as not to set a bad example for kids. 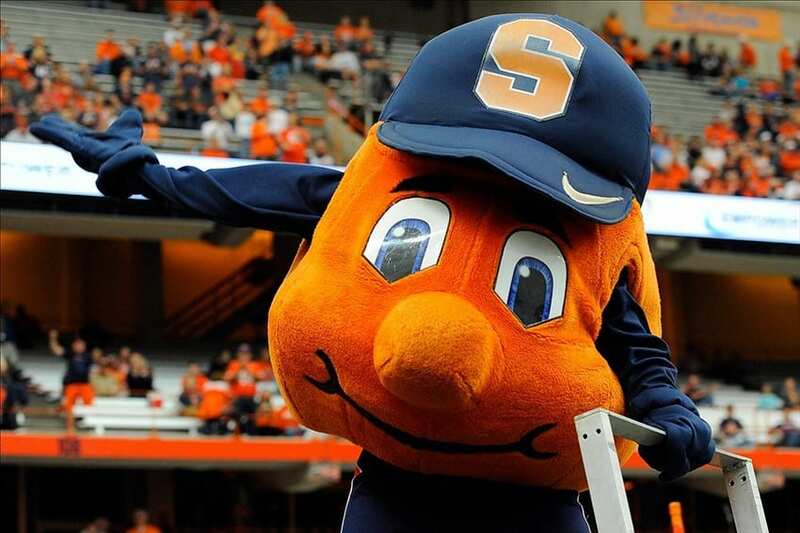 They’re the Syracuse Orange, so it would make sense that their mascot is a legit orange. He may look nice and sweet in pictures, but Otto the Orange also has a mean side and has a knack for causing trouble and picking fights with opposing mascots. He dresses up for the holidays, goes crowd surfing in the stands, and has a spin that makes the Carrier Dome crowd go wild. You may have never heard of him before, but Syracuse fans have a special place for Otto in their hearts. 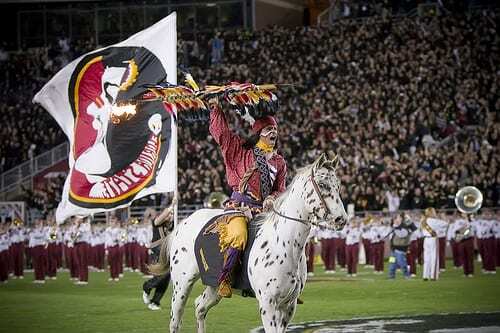 Florida State’s Chief Osceola is a guy completely dressed in head-to-toe Native American gear, with face paint and all, riding a horse and throwing flames into the ground. Does it get much better than this? Well, it may depend what side of the morally correct spectrum you are on… Florida State pregames are nothing without Osceola on the field getting the crowd going. The tradition began in 1978 and at the moment Osceola rides Renegade VI, the sixth horse to take part in this spectacle. Whoever thought bringing a real, living tiger onto a college football field may have been a little crazy. But so far so good. 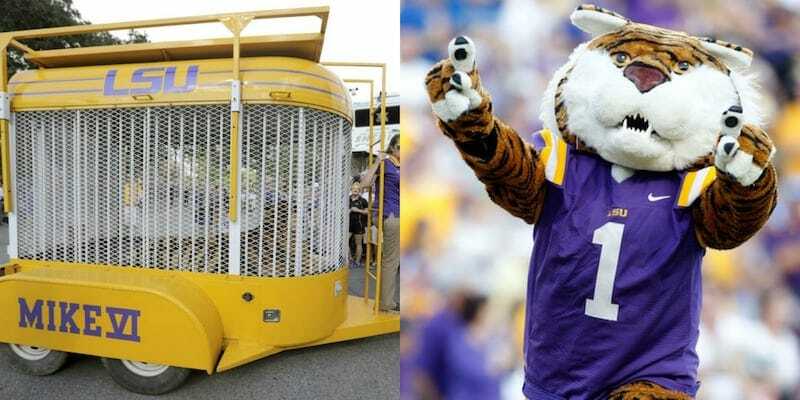 Mike the Tiger arrives at Tiger stadium for home games during the season, at times with cheerleaders riding on top of his cage. The current tiger is the school’s sixth since 1936, and has his own habitat near the stadium. But when the live tiger isn’t around, there is also the more friendly, fuzzy one that is okay to hug and gets the crowd going. 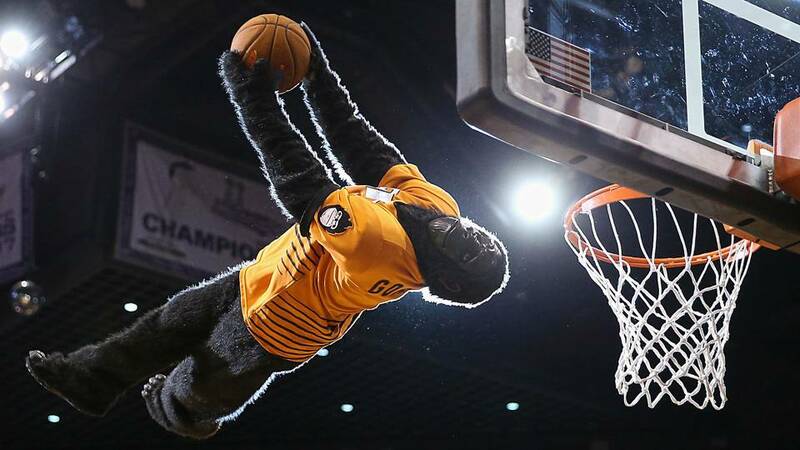 It took the Phoenix Suns 11 years to find a mascot, and it ended up being a gorilla. Go the Gorilla made his debut in 1980 when a singing telegram was sent to the area, and security suggested he stay a while. He’s been entertaining the Suns faithful ever since, with acrobatic dunks (even through fire) and injuries throughout the years. One of the men who donned the costume had suffered broken teeth, a broken finger, stitches to his tongue and surgeries, all for entertainment purposes. It wasn’t all in vain, Go was admitted to the Hall of Fame in 2005. Before Wall-e there was Wally, the Boston Red Sox Green Monster. 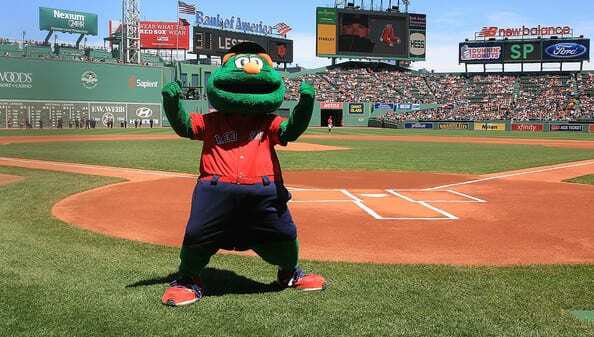 He didn’t make his debut until 1997, and is named after the famous Green Monster at Fenway Park. But even though Wally is only 20 years old, he was quick to make a name for himself as one of the greatest mascots in all the leagues, especially with Boston fans and kids. He’s even been on an ESPN SportsCenter commercial and has a feud with the Philly Phanatic (another mascot who appeared on this list). 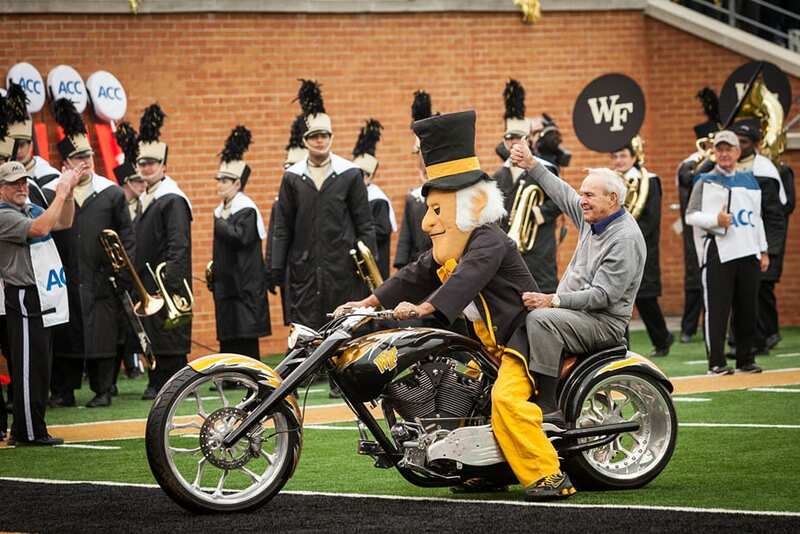 The Demon Deacon is the coolest mascot in the game, how many others have the chance to ride in on a custom built motorcycle. The Wake Forest mascot sports a top hat and bow tie, and for the most part doesn’t look like the “demon” he represents. His history goes back to the early 1920s, but his look evolved in the 1940s, when a Wake Forest student dressed up as a Demon Deacon for a contest, and so his look came to be. He’s changed a lot since, but still remains his classy self, with his bike and crowd pleasing antics. The Presidents aren’t the Nationals’ primary mascot, that would be Screech, an Eagle. But they are the team’s most entertaining mascots, and perhaps the best in all of sports. 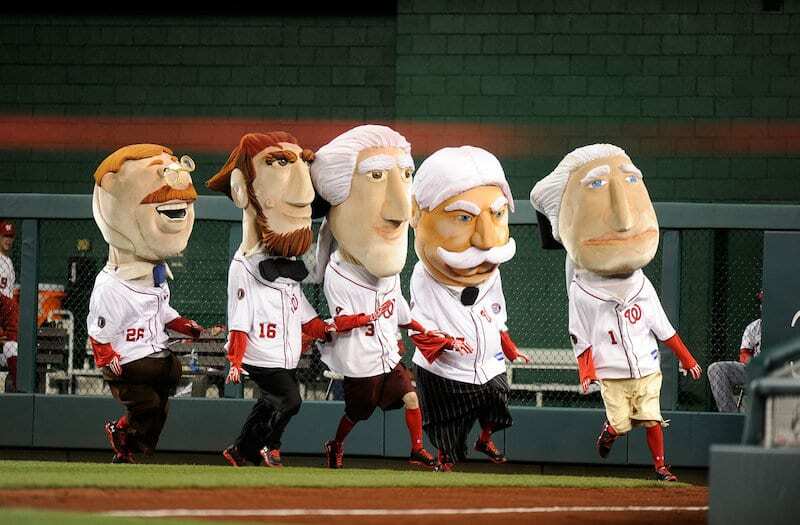 The Presidents’ race during the seventh inning stretch is one of the biggest crowd pleasers, with the different characters always trying to sabotage each other in order to win the race itself. George Washington is the quintessential winner, but Thomas Jefferson, Abraham Lincoln, Teddy Roosevelt, William Taft and Herbert Hoover participate as well. 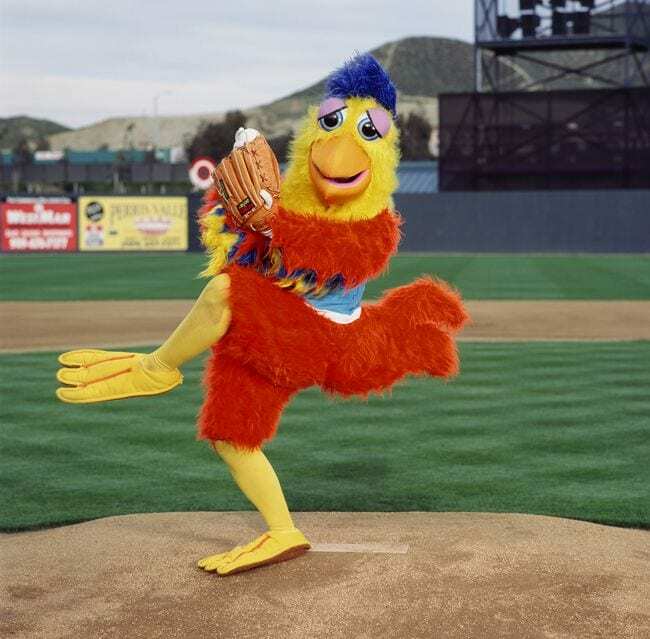 The San Diego Chicken, A.K.A. the Famous Chicken has been around since 1974 and quickly became one of the most popular mascots of all time. He may have originally been associated with the Padres, but this chicken has no limits, and is known for popping up at different concerts and sporting events around the country. The man behind this mask has been the Famous Chicken for over 40 years, and is well into his 60s. He’s had articles published about him and he’s been praised over and over by other mascots around for his energy and his ability to entertain.